Scroll Below Resources for News Update! 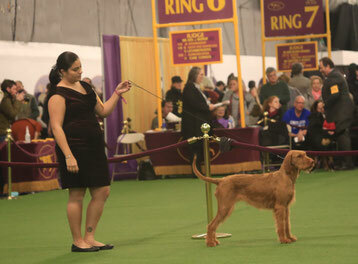 The WHV Club of America is the official AKC Parent Club of the Wirehaired Vizsla. On this site you can find information and history about the breed, membership information, and other great info! 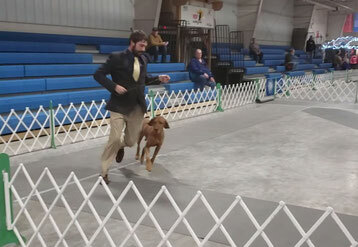 Zoldmali Kennel is the world's #1 dual purpose kennel for Wirehaired Vizslas. Zsofia Miczek has been training and breeding WHV for over 17 years. Her accomplishments and dogs are just astonding. Her knowledge and the way she understands not just her dogs, but all those around her is uncanny. She is truly and amazing person to know and learn from about this breed! This is a database of smooth and wirehaired vizsla heritage and pedigrees. The database can help breeders keep wireharied vizsla lines stay healthy by following responsible breeding. The Canine Chronicle is a website and a publication that has information about the showing (conformation show) world. You can find statistics here of the top rated dogs in the country (including wirehaired vizslas). There are also articles about showing, breeding, and other dog info. The AKC is a site with wonderful resources on it. You can find information about many breeds including the WHV. Below is a link to the AKC site and to the AKC WHV specific page. Also see below the standards document put out by the AKC on the WHV. This document details the official standard of the Wirehaired Vizsla. You can find this on the AKC website under the Wirehaired Vizsla page. Now that the snow is melting, we went to our first conformation show of the season! Kolibri won best of opposite for the breed the three days we were there! Thank you Stephanie Hentschel for handling her! Quill won best of winners and Delceg was showed well but didn't win. You can tell that he hates showing but he looks magnificent in the hunting field! The dogs helped us announcement an important and exciting addition to the family!!! We enjoyed the winter with our dogs! Hiking and Cross Country Skiing....the Wisconsin Winter was brutal this year. It was a wild and wonderful ride having our first litter! We were in the midst of produce and pumpkin harvest for the farm and juggled our puppies and farm pretty well. Our pups made it to the most wonderful homes! We are so happy that our puppies all got lucky to get amazing puppy parents! 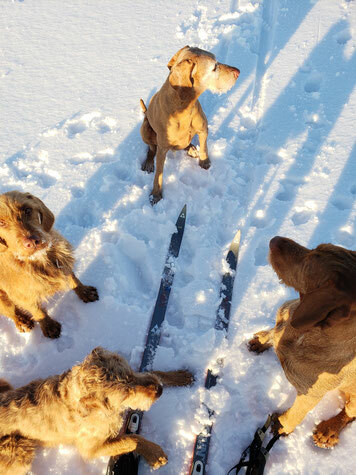 The Farm and House were over run with Wirehaired Vizslas - it was amazing. Zsofi Mizcek and Extreme came to lead the hunting training, all the way from Hungary! It was hot and buggy, but we all had a wonderful time. Thank you to everyone for the memorable hunting training. 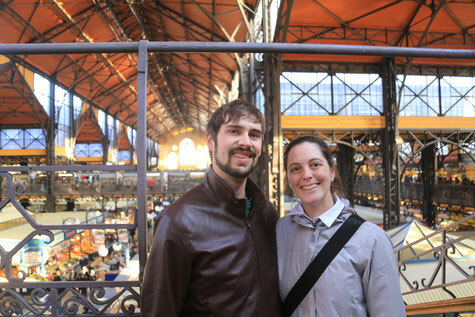 We had a fantastic trip to Hungary. The food is incredible, the sights beautiful, and the baths relaxing. The best part was visiting Zoldmali Kennels and bringing home our two new additions to the family! See our pictures below. Thank you to Zsofi and Lazi - We had an amazing time and learned so much. Truly a trip of a lifetime! Our new pups! (and Quill). Eric, Megan, Lazi and Zsofi. We had a fantastic time! Quill is a WESTMINSTER Winning dog! Brittany showed Quill today and they did great! Quill showed like a champ! Quill was awarded with Best of Opposite! Eric and I are thrilled and so proud our "farm" dog has done so well. Eric, Quill, and I are headed out to Westminster! Eric heroically drove us through the Chicago snow storm. 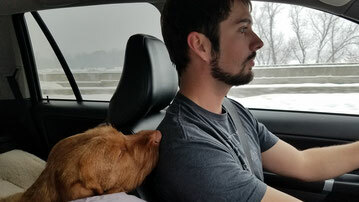 Quill is finding a way to sleep on Eric, even when he is driving...pretty adorable! We are talking a morning walk on a cold January Day. The dogs just love our walks! There is always something to sniff out. Quill, back on the farm, is helping retrieve those pesky barn pigeons! She's a natural! Quill competed in Orlando at the Royal Canin Dog Show and took BOB on the first Day against a competitive field of Wirehaired Vizslas! Great Job Quill and Brittany! Quill competed at the Philadelphia National Dog Show and made sporting group that will be aired on Thanksgiving Day on NBC after the Macy's Thanksgiving Day Parade!! Gambit had a very complicated but successful track and kill. The rabbit played dead when he finally found it then gave a good quick chase which Gambit successfully ended. After such a complicated track, it was very good for Gambit's confidence to have found the rabbit! Quill is headed out to PA for the Bloomburg Show, then to NC for the Wilmington Show, then back to PA for the Oaks show Nov. 18th -19th. We'll miss her while she's gone! I won't miss getting my leg room back. The picture on the right is waking up with her hogging all the leg room so she can look out the window. Gambit, Quill, & Megan were out for a farm walk. She found something interesting and holding a point. Quill like (like most WH Vizslas) LOVE to nap on people. She will hunt for a napping spot and will beg to climb up into your lap. She's a good snuggle bug. This was a great weekend for Quill and Brittany Greendeer. Brittany handled Quill and they came away with 3 group placements this weekend! Quill won a Group 4, Group 3 and a Group 2 (see her photos in the gallery and to the right is her group 2 win photo).